There's a new book on the shelf that I reserve for the fine work of my friends over at Cross + Roads Press. Not that I expect Saturday Nights at the Crystal Ball to spend much time on the shelf. Far too much good material to set it aside for long. Sharon Auberle is storyteller enough to find and relate what is unique in her life. She is poet enough to show us what is universal. She has deftly tackled subject matter that in lesser hands could have been maudlin, even trite -- but has triumphed in a way that elevates us. Her luck in collaborating with editor/publisher Norbert Blei assured an elegant book to stand beside the thirty others from his press. Blei's decision to reproduce pages from the author's journal, written in the days immediately preceding her mother's demise, was a brilliant one, giving us a very palpable connection to the writer in a time of vulnerability juxtaposed with great strength. 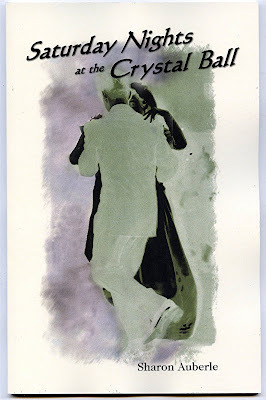 The book is Saturday Nights at the Crystal Ball, by Sharon Auberle, ISBN 978-1-889460-21-5, $12 from Cross + Roads Press, P.O. Box 33, Ellison Bay, WI, USA, 54210 and don't forget to slide them a couple of bucks for the postman & the packaging.